It is a DC Buck Charger Voltage range AC 90~240V to DC 5V 500mA Voltage Regulator Switch Power Suppl.. It is a DC Waterproof Buck Converter, voltage range 8-35V to 5V, output power 25W, maximum conversio.. The DC step down buck converter, waterproof aluminum case, voltage range 5-22V to 3.3-12V, it has ov.. 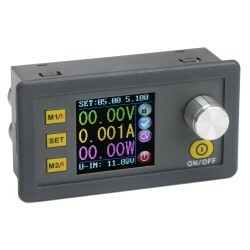 It is Charger Power Supply Switch Power ,Voltage range AC 90~240V to 5V 800mA 4W Buck Converter , It.. It is a Step Down Voltage Regulator/Adapter/Power Supply Module/Driver Module, Input Voltage: DC 16~.. It is a Buck adjustable Voltage Regulator/Power Supply Module/Adapter, Input voltage: DC 3.2V~40V (I.. It is a Buck Adjustable Voltage Regulator/Power Supply Module/Adapter, Input Voltage: DC 4.5~35V, Ou.. It is a 15W USB Charger/Adapter/Car Charger, Input voltage DC 12V (8-20V),Output voltage DC 5V，maxim.. It is 100W Dual Output Power Adapter/USB Charger, Input voltage : DC 3~35V ( limit 36V), Output volt.. It is Buck Converter Adjustable Voltage Regulator/Adapter/USB Charger/Laptop Power Supply, Input vo.. It is dual channel output DC buck converter, voltage range for DC 8-30V to 5V, maximum output 5A, ha.. It is a 100W Power Converter/Power Supply Module/Adapter, Input Voltage: DC12~24V, Output Voltage: D.. It is a 200W NC Adjustable Voltage Regulator/Power Supply Module/Adapter, Input Voltage: DC 6~40V (p.. It is a DC Buck Converter/Power Adapter/Power Supply Module, Input voltage:DC 7~35V, Output voltage:..